Last year for homeschool we chose to use Seton Home Study which was an accredited Catholic curriculum. We made our decision to homeschool and bought our curriculum all in two days. We didn’t do any research into curriculum or learning styles. All I knew was that I needed something that was completely put together to walk me through day by day because I was scared to homeschool! Can I do this? Will my kids hate me? Will I fail my children? Those were all the thoughts going through my head when we made the decision. Let me tell you… we LOVED homeschooling last year. I wasn’t really happy with the curriculum, but we so fell in love with the freedom of homeschooling. I got close to my kids and we ultimately had a good time. My kids don’t even want to go back to public school! Seton was a very still, very long, and it was boring for our family. I didn’t like that my kids were still sitting alone working on workbooks all day long. My oldest would have approximately six hours of school work every day. He may as well have been in public school still! I loved the Catholic aspect of the curriculum and felt that as a family we learned a lot about the history of our faith. I didn’t like that I’d work on one area with one kid and then a week later cover the same subject, and then another week later cover the same subject. I felt like I was wasting time! I knew I wanted something different for this year. I wanted to focus less on grades and more on family. I wanted family centered learning. I want book centered learning. I know for myself with learning a subject that I learn best with a story. I fell in love with what I’ve heard about Sonlight. Sonlight is literature-based learning that is an educational philosophy based on children’s natural curiosity and love for stories. 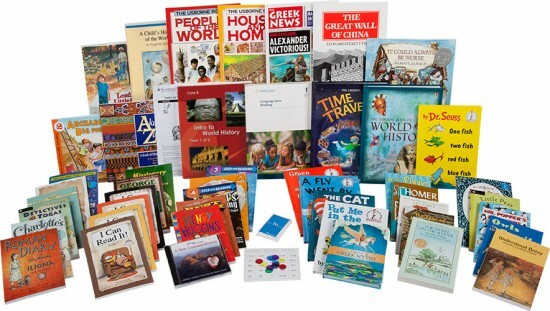 They use outstanding books as the centerpiece for learning. They also help you teach from the perspective of God’s truth and His love for all people. I love that Sonlight has what they call cores. Cores cover about 3 years of children’s ages so that you can work together as a family. Yes, I have a 6 year span between my 3 older kids, but the nice thing is you can always add more to what you are doing. Sonlight should only take approximately 2 hours a day to complete our work! I am starting Core B which starts with History of the World. We will be learning together with read alouds and working on our work together as a family. They will each have their own separate math and language arts based on their level, but the majority of our work will be together. I will be adding age appropriate reading in for Buddy for him to do on his own. Sonlight is a Christian/Bible based curriculum. In order to continue our Catholic faith formation, we will be adding in learning about a Saint every day and also taking Family Faith Formation put on by a local church. We haven’t received our books yet, but I can’t wait! I’ll share more about the actual curriculum when it gets here. I’m really excited! I’d love to hear if you’ve used Sonlight and what you think about it.